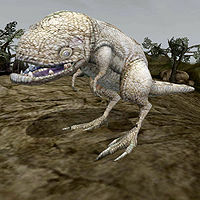 Guar (or guars) are large bipedal reptilians native to Morrowind and Black Marsh. They are the primary domesticated herd animal of these provinces, and are not usually aggressive. Characterized by their endurance and low intelligence, guar are used mostly as pack animals and beasts of burden, although certain breeds are used as mounts. 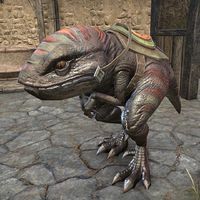 Although usually associated with the Dunmer, guar have a special relationship with Argonians and the Dunmer traditionally employ Saxhleel slaves as guar-herds and handlers. A young guar is called a calf. 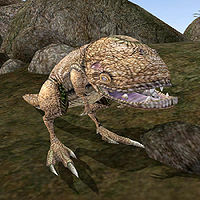 Despite the name, bantam guar are actually a member of the scuttler family, more closely related to cliff racers than guar. 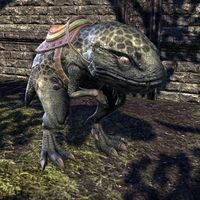 Domesticated guar are regularly seen outside their native lands, and have been imported into Cyrodiil as beasts of burden for hundreds of years. Guar are often raised or hunted for their hide, milk, and meat. Albino Guar, also called White Guar, are a rare type of guar. They often feature in Ashlander prophecies, and bezoars taken from their stomachs can be used in rituals. 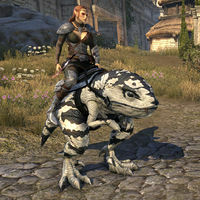 The Banded Guar Charger is a breed of striped guar used as a war mount. They are related to the feral tiger guar. 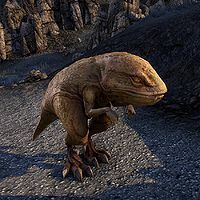 The Common Vvardenfell Guar is the most common breed of guar. Despite the name, the breed is not limited to the island of Vvardenfell. Freckled Guar are considered to be the most intelligent breed of guar. They can be taught to come when called, and some can even be house-trained. As such, they're regularly kept as pets in Deshaan. Frostbane Guar is a strange breed of guar found in Skyrim. It has a shaggy white coat, adorned with symbolic hair-knots and hide strips meant to protect it from the frigid climate. The practice of adorning mounts with these dangling "Frostbane talismans" is an Atmoran tradition dating back to Ysgramor's arrival in Skyrim. The ancient Nords worshipped totem animals as gods, and Frostbane talismans continue to be used into modern times. Since the guar is native to warmer climates, the existence of Frostbane Guar suggest that these wards do in fact protect against the cold. The Frostbane Pony Guar is a smaller breed which has long been popular among the more traditional aristocracy of Riften, who enjoy dressing them in Frostbane garb and keeping them as pets. Glowgill Guar are an exotic breed of guar bred by a coastal Argonian tribe near Archon. They have dark navy skin with bright blue bioluminescent striping and glowing blue eyes. They are a gilled breed of guar, although it is unknown if their gills actually allow them to breathe underwater. Glowgills are often used as mounts. 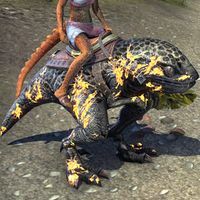 Golden Eye Guar (or "golden-eyes") are a breed of guar used as a mount. It is a cross between a Banded Guar Charger and a wild guar, known for its difficulty to control and its distinctive golden eyes. Despite the difficulty involved in training one, Golden Eyes are fearsome, loyal, and intelligent. The Green Narsis Guar is a robust breed, used as the standard mount and dray-beast of central Morrowind. It's named after the city of Narsis. The Hist Guar, known in Black Marsh as Scales-Seem-Daubed-with-Hist-Sap, is a subspecies of guar which appears as if it has splotches of glowing Hist Sap splattered across its green skin. It is unknown if the breed actually has any connection to the Hist or to amber plasm. The Hist Guar is used as a mount, and is the only subspecies known to enjoy music. Hollowjack Rider Guar are a mysterious breed usually only sighted on the night of the Witches Festival. These sightings are the result of Jaque o' the Hollow, a malevolent Rivenspire spirit that curses riders all across Tamriel to ride headless through the night. 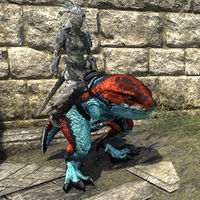 Guar riders stricken by this curse can be sighted riding headless atop jet black guar mounts with red eyes. Hollowjack Rider Guar appear to be native to the realm of Detritus and can be summoned from that realm. Pack Guar are bred to serve as pack animals. They are often used by traveling merchants and Ashlanders. The Pale Velothi Guar is a breed that hails from the ashlands downwind of the volcanic Velothi Mountains. They are used as mounts, and are renowned as hardy creatures capable of enduring especially harsh conditions. Pony Guar are a smaller species of guar that are rarely exported since they lack the physical strength of their larger cousins. Not well known outside of southern Morrowind, pony guar are usually bred as a curiosity, although some are raised for their meat and skins. Psijic Guar Exemplars are a breed of guar created by the Psijic Order. Like all Psijic Exemplars, this breed theoretically represents the ideal form a guar can assume, at which point the creature transcends the physical and incarnates the mystical. As such, Guar Exemplars take on a yellow ghostly form. They are used as mounts by Psijic monks when traversing the marshy terrain of Black Marsh or southern Morrowind, and are unequalled in this task. 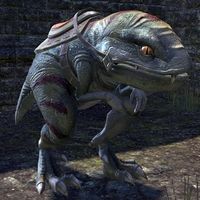 The first guar came to Artaeum when a Psijic advisor to the Tribunal returned from Mournhold with a Pony Guar in the middle of the First Era,, so the creation of Guar Exemplars presumably began sometime after this. Psijic Mascot Guar are a breed of guar created by the Psijic Order for use as pets. 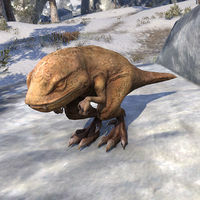 Like all Psijic Mascots, it is unknown if these guar are real animals with an enchanted appearance, or illusory constructs created from Magicka to be used as beast companions and portable storage batteries of Magicka. The Psijics refuse to clarify the true nature of these creatures, although they have dismissed the theory that Mascots are simply portable batteries. In appearance, the Psijic Mascot Guar is a black guar which glows with Magicka through the mystic blue runes that embellish its possibly-illusory epidermis. 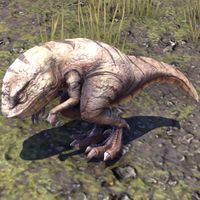 Guar have been favorites of the Psijics ever since the first one was brought to Artaeum in the middle of the First Era, and Mascot guar calves are very popular as pets. Shadowghost Guar are a mottled black and white breed of guar and are the only known nocturnal breed of the species. Due to their nocturnal habits and the fact that their patterned hides blend in with the shifting gray ash clouds on the slopes of Red Mountain, the breed is rarely seen even by the native Dunmer. 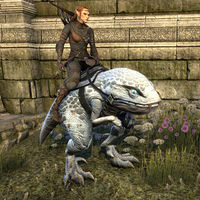 Nevertheless, Shadowghost Guar are sometimes used as mounts. Shadowghost Pony Guar are a smaller breed also native to the slopes of Red Mountain. They are sometimes kept as pets. Skyfire Guar are often mistaken as being poisonous due to their colorful pattern. Patience is needed to bring this breed to heed. 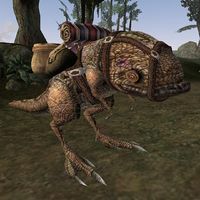 The Striated Pony Guar is a breed of pony guar kept as household pets in Morrowind. 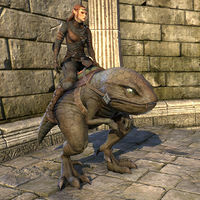 The Tessellated Guar is a multi-purpose guar mount, at home anywhere from swamps to ashlands. Tiger Guar are a legendary breed of large wild guar, and are a highly prized game animal for noble huntsmen. Found only on the Deshaan Plain, tiger guar are sometimes thought to be nothing more than a Legion myth. The banded guar charger is related to the tiger guar. 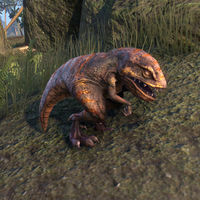 Wild Guar are usually docile, but can sometimes turn feral and attack travelers. Some Dwarven vamidiums were constructed in the shape of a guar. Conjurers are able to compel Atronachs to adopt the form of a guar. 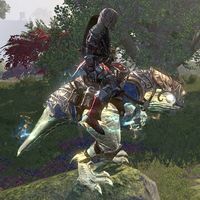 The Hist have shaped the native lizards of Black Marsh to create Guar-Lizards for use as steeds by the Argonians. This page was last modified on 19 February 2019, at 20:34.